I realize the one picture might be hard to read. Here it is in three sections. 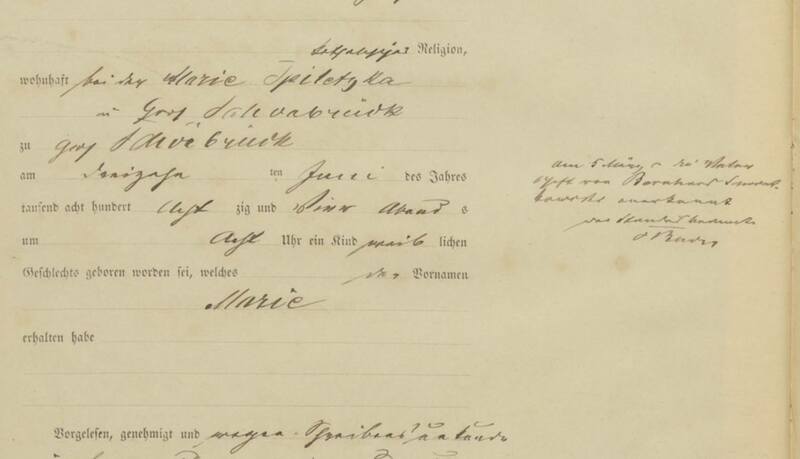 Hello, I have a birth certificate for my g-great grandmother Marie. I had some help getting most of the information off of here but I would love to have it looked at again. Specifically, Marie's mother Eva was married 5 months AFTER this birth to a Bernard Swiatkowski and Eva had another daughter (Pauline) born 2-3 years prior which I am unable to find birth certificate for. Does anything on here say Eva was married before? Widowed? Divorced? When I found Eva and Bernard's ship manifest to the U.S. they all had taken Bernards surname. 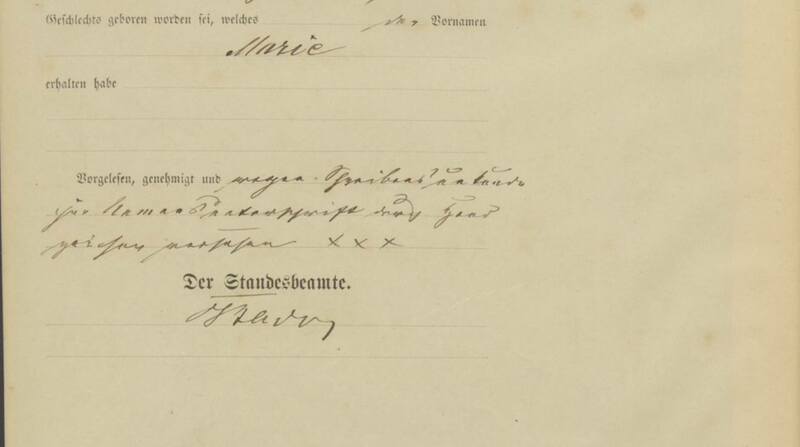 When Marie’s mother Eva Schön gave birth to her child on June 13, 1884, she was not married: „Vor dem unterzeichneten Standesbeamten erschien heute, der Persönlichkeit nach bekannt, die unverehelichte Eva Schön …” [Before the undersigned registrar appeared today, of know identity, the unmarried Eva Schön … ]. According to this, Eva’s status is given as “Dienstmädchen” [servant girl] and “defl.” [deflorata, i.e. no longer virgin] in the marriage record from November 10, 1884. 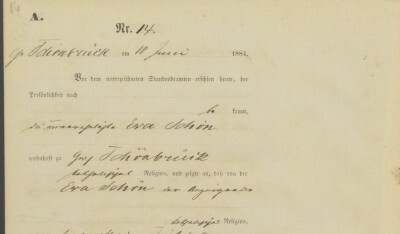 Bernard Swiatkowski recognized Marie as his child on March 5 [no year provided] according to the remark on the right side of the birth record: “am 5. März wurde Vaterschaft von Bernhard Swiatskowski anerkannt. der Standesbeamte (signature)”. Excellent and thank you. What religion does it have for Eva? Can you think of any way for me to go about finding if Schön was her maiden name or if she had a previous marriage? I have looked through the same books from Family Search and cannot find a mention to her in a birth or previous marriage. Eva is a direct maternal ancestor and I cannot find a way to go back from her if I don't know her birth name. When you combine this record with the marriage record from the parish register you find the answers to your questions. Schön was her maiden name. There was no previous marriage. She gave birth as a single woman, although, as Michael points out in the notation, Bernard acknowledged paternity. Michael points out that the abbreviation defl., which also appears in the parish marriage register, stands for deflorata. The word deflorata is a Latin term which sometimes appears in Latin records as “virgo deflorata” and means “a deflowered maiden”---just a polite way of saying that the woman, although she had not ever married, was not a virgin in the technical sense. The term was used when a single woman who had given birth married at a later date. If one were to translate “virgo deflorata” as a “deflowered virgin” the result would be a metaphysical fizzle which defies the Western philosophical principle of non-contradiction (a tenant which is considered true in Western philosophy, but not in some Eastern philosophical systems). The principle of non-contradiction means that a thing cannot be and not be at the same time. A deflowered maiden makes sense whereas a deflowered virgin does not. 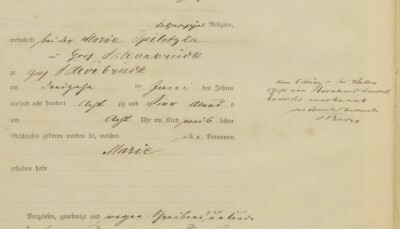 The parish register also states that both the bride and the groom were Catholics. I believe that you can safely end your quest for a previous marriage for Ewa. The search for her birth record is another case...that search can and should continue. Dave, yes I understand your conclusions to the question I posed. Did you see in my first post the fact that Ewa had another birth before Marie? Circa 1882.That is where my confusion on her number of marriages arises. I do realize she could have had that child also out of wedlock but I am working under the presumption that this would not have been the norm. 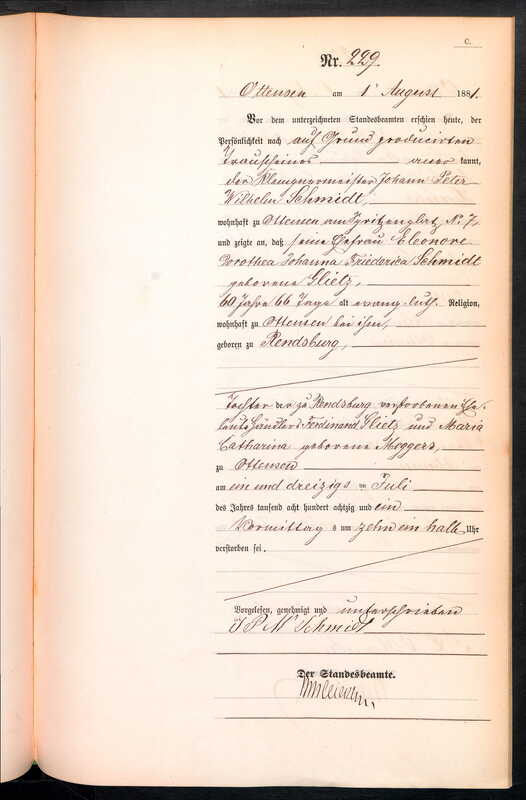 I am also leaning towards the side of Schöen being the actual maiden name mostly because I would think the marriage document that I do have would most likely have also listed something to the effect of her being either widowed or divorced. I truly appreciate everyone's input. It gets hard only having your own ideas to play off of. Posted: Mon Jun 18, 2018 3:42 pm	Post subject: Translation Help Please? Could someone please help me with this translation? Posted: Mon Jun 18, 2018 6:54 pm	Post subject: Translation Help Please? Could someone please help with this translation? Posted: Wed Jun 20, 2018 4:02 am	Post subject: Re: Translation Help Please? Please find attached the translation. C. [indicating it’s a death record] No. 345. Hamburg, on April 29, 1901.
in Hamburg in the latter home on April 27 of the year thousand nine hundred and one at half past three p.m. had died. The notice giver declared, that she knows about this death from own experience. Read aloud, authorized and signed. Dorothea Gerlach. Hamburg on April 29, 1901. Posted: Wed Jun 20, 2018 4:04 am	Post subject: Re: Translation Help Please? C. [indicating it’s a death record] No. 229. Ottensen, on August 1, 1881.
in Ottensen on Juli 31 of the year thousand eight hundred and eighty one at half past ten a.m. had died. Read aloud, authorized and signed. J.P.W. Schmidt. (item for the back of the document). 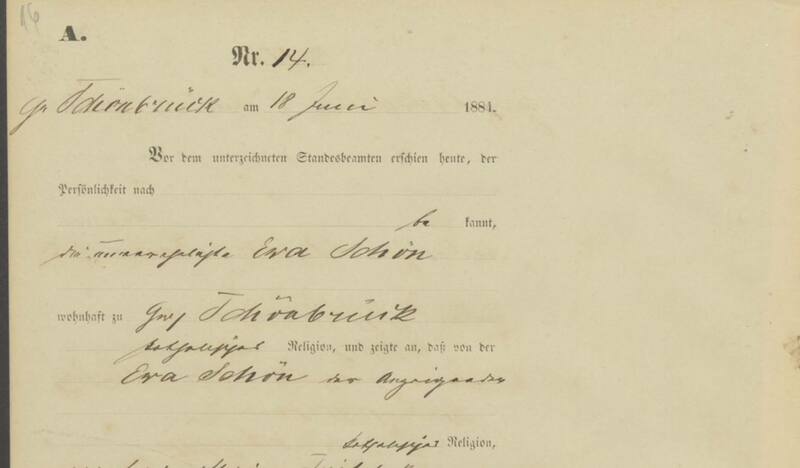 Your person [I read the given name as Kasimira] was born in the city of Bnin, county [Kreis] of Schrimm and moved for the first time at the age of 16 on April 6, 1906 within Bnin to Gr. [Große] Grabenstr. 54. Wardeska seems to be the name of the landlord and/or the employer. The next moves in February, April and July 1915 were within Bnin. On November 28, 1915 she moved to Dziecmierowo, county [Kreis] of Kreis Schrimm. Between November 1915 and November 1917 she obviously moved to Ludzisk, county [Kreis] of Strelno, as she returned from Ludzisk to Bnin on November 25, 1917. On May 2, 1918 she was still in Bnin. 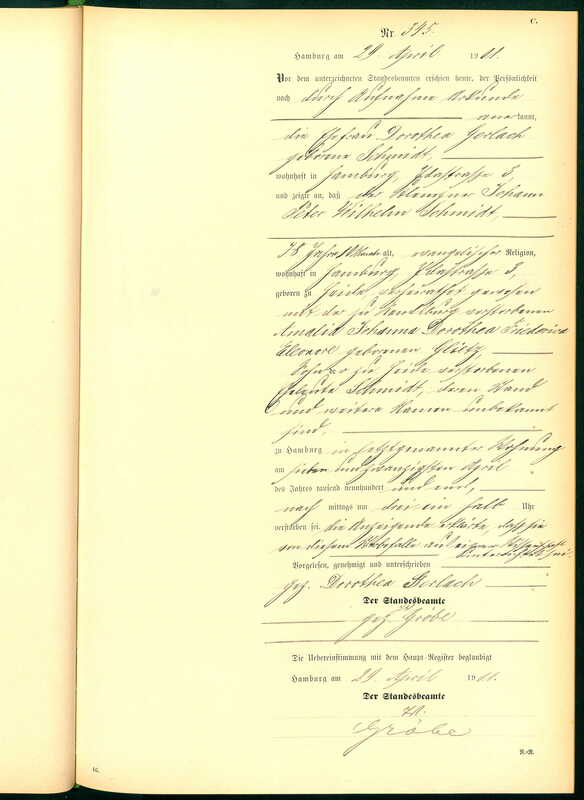 The last two entries are written in Polish and I am not sure about them, but it looks as if she moved to Dobezyn on October 5, 1921. Is it possible to translate this one too? The gardener Ludwig Sikorski, of Catholic religion, born on August 8, 1864 in Bnin, [Kreis] Schrimm. His wife resides in Blocko [unsure about this name] county [Kreis] Wongrowitz. 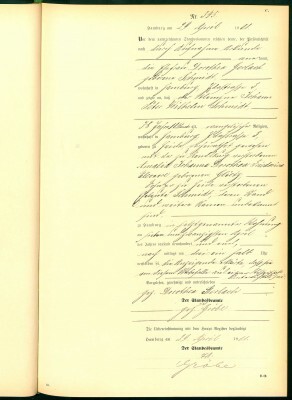 On November 11, 1899 they moved from Tonischewo, county [Kreis] Wongrowitz, to Bnin. I am unsure about the street name, it looks like Wilda Krovjanzenstr. No. 93. The name of the landlord is given as X Gajewskz [unsure again about the last character]. On December 12, 1899 they resided in Bnin. Here is another card, wherein there is the same adress name (maybe it can help to surely translate)? Yes, this is a help: Kronprinzenstraße (literally: the street of the crown prince).